Home » Adventure » Sierra-at-Tahoe Closes. If you suffer from FOMO - we've got your meds. F.O.M.O. (Fear Of Missing Out) noun.—social angst characterized by a desire to stay continually connected with what’s going on around them. 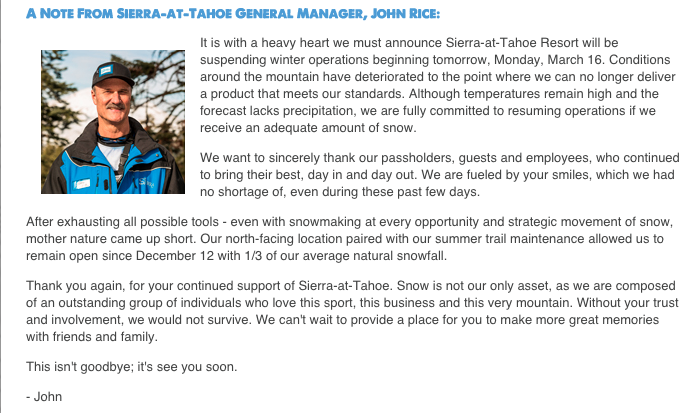 SIERRA-AT-TAHOE SHUTS DOWN SHOP…. for now at least. After a less than stellar season and a months long struggle to keep a soggy mountain in operation, Sierra has decided to throw in the towel. In fact, there are not enough sad face emoticons in this world to express our broken hearts with regard to this matter. We just want to thank everyone over at Sierra for trying their hardest to keep our local shred spot open as long as it did, and even letting us pond skim for a few weeks before closing its doors.